We can use condiments to “upgrade” the taste of so many different foods. However, there are so many different condiments, and not all of them are good for us. Additionally, some don’t even taste good. With this in mind, this article provides a list of 15 healthy condiments that taste delicious. Whether you prefer something a little bit spicy, salty, sour or creamy, there is something for everyone here. Firstly, there is a little bit of controversy around what condiments are. While some people think of condiments as things like mayonnaise, ketchup, and mustard, others believe that sauces and foods like capers meet the definition. In this list, we will class condiments as anything used to either complement or enhance the taste of food. Key Point: Condiments can be sauces or preparations that we add to food to improve the overall flavor. Sauerkraut is a popular condiment made from fermented cabbage. Typically, people use a spoon or two of sauerkraut alongside their dinner or the main meal. Interestingly, and in contrast to popular opinion, sauerkraut is not from Germany. The condiment is very popular there, but sauerkraut originated in China. Although there is no proof, it is believed that Genghis Khan brought sauerkraut from Asia to Europe during the times of Mongolian conquests. The condiment has a refreshing taste, and it has a crunchy texture and, due to the lactic acid bacteria it contains, a slightly sour flavor. While we can eat sauerkraut either hot or cold, cooking it will kill the potentially beneficial bacteria it contains (1). Sauerkraut works especially well with dishes involving beef, pork and meat products like sausages. Key Point: Sauerkraut is a condiment used alongside food as a side dish, or sometimes it tops meat-based foods. Mustard is one of the world’s most common condiments, and it has a deep, flavorful and slightly spicy taste. Whole grain: this variety contains the whole mustard seeds, and it is especially prevalent in France. Compared to regular yellow mustards, it is much stronger in flavor, which may be a positive or negative depending on personal preference. Yellow mustard: comes in several forms including ‘English mustard’ and ‘American mustard.’ It is weaker in flavor and contains more vinegar. Mustard has an enjoyable warming and slightly spicy taste, and it is well-suited to food like meat and sausages, and also to create salad dressings. Lastly, it is worth noting that some of the cheaper brands contain vegetable oils and food coloring, so check the ingredients label to see if you’re getting the 100% real thing! Key Point: Mustard is a globally popular condiment that adds a lot of flavor to food. Tamari is a kind of soy sauce, and it comes from Japan rather than China. If someone likes the taste of soy sauce, then tamari is likely a good option since it is similar but more flavorful. In contrast to the wheat and soy mixture in traditional Chinese soy sauce, tamari either contains very little wheat, or none at all. As a result, it has a unique taste that people describe as being “fuller” and “more flavorful” than soy sauce. Another difference is that tamari is less salty than regular soy sauce, and it also has a slightly thicker texture. Other than these differences, tamari and soy sauce have a similar visual appearance. For a good tamari pairing, raw fish (sashimi) is delicious. Key Point: Tamari is a traditional Japanese sauce that is thicker and more flavorful than soy sauce. There are lots of great things about avocados, and one of their major plus points is that they provide us with guacamole. Guacamole is a Mexican condiment that exists in many different varieties, and standard recipes revolve around avocado, tomato, lime juice and salt. Over recent years, both avocados and guacamole have exploded in popularity around the world, and this is a good thing for public health. Notably, avocados are one of the most nutrient-dense foods money can buy and contain a wealth of healthy fats, fiber, and high concentrations of potassium, vitamin C, and B vitamins (4). For more on guacamole, see this complete guide. Key Point: Guacamole is a delicious and very nutritious condiment that originates from Mexico. Mayo is delicious, and it helps to improve the taste of the food we use it alongside. However, most in-store options are not so healthy and contain significant amounts of vegetable oil and preservatives. For a healthier and fresher mayo, it is quite simple to make our own at home, and you only need a handful of ingredients. Once you have these ingredients ready, you only need about 10 minutes of time. Firstly, combine the egg yolk, lemon juice, mustard, salt and pepper and put it in a blender. While the egg yolk mixture is blending, very (very!) slowly drizzle the oil into the blender. Unfortunately, the mixture won’t correctly emulsify if you pour the oil into it too quickly. To do this safely, it should take around 6-7 minutes. Key Point: Homemade mayo is easy to make, and it is much healthier than store-bought versions. Red wine vinegar is an interesting condiment and using it has several benefits, for the food itself and also for our health. For instance, when we marinate steak (or any other meat) in red wine vinegar, the acid in the vinegar breaks down the meat’s muscle fibers. As a result, the vinegar has a tenderizing effect on the meat, which makes it softer (and tastier) after cooking. Regarding the health benefits, consuming red wine vinegar alongside food can have an anti-glycemic effect. In simple English, this means that the vinegar reduces our body’s glucose response to carbohydrate-containing meals (6, 7). To read more about the health benefits of red wine vinegar, see this link here. Further to red wine vinegar’s benefits, this condiment also imparts a delicious, slightly fruity flavor to food. Key Point: Red wine vinegar has a lot of uses in the kitchen, it tastes great, and it is good for us too. Coconut Aminos is a unique and relatively new condiment. To make this drink, the producers mix sap from the coconut tree with sea salt and allow it to age/ferment. While it looks like soy sauce and shares a slightly similar salty flavor, the taste is quite a lot different. For one thing, Coconut Aminos is milder in flavor and has a slightly different taste, with hints of sweetness. Overall, it will work well as a soy sauce alternative, but it might not be the right fit for someone who enjoys the strong flavor condiments like tamari offer. Coconut aminos can be used to flavor a variety of dishes, and you can read a full guide on it here. Key Point: Coconut aminos is an alternative option to soy sauce and tamari for those who prefer a milder taste. Similar to sauerkraut, kimchi is another condiment made from fermented cabbage. However, that is where most of the similarities end. While sauerkraut is a pure blend of cabbage and salt, this spicy Korean side dish contains a whole host of pungent ingredients. There are also dozens of different kimchi varieties, and it can include other vegetables such as green onions, chives, radish, cucumber and more. Although the smell can be quite overpowering, kimchi has an unusual (but good) and mildly spicy taste, and it works well in combination with other foods. One of the most popular recipes involving this condiment is kimchi stew, which we can make by frying pork and kimchi together, adding water, bringing to the boil, and then simmering to make a stew. 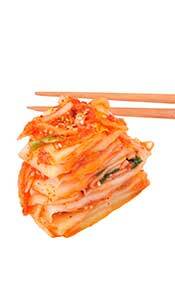 Key Point: Kimchi is a lightly spiced side dish that can add a lot of flavor to food. 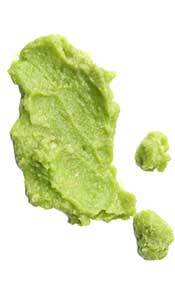 Wasabi is a green-colored Japanese condiment that people often enjoy in combination with raw fish and soy sauce. Concerning its overall flavor, wasabi is one of the most potent condiments available, and eating a bit too much can lead to a burning sensation in our nose. This burning feeling is actually due to a chemical in wasabi called allyl isothiocyanate. Interestingly, when we eat wasabi, this chemical reacts with (and irritates) the mucous membrane in our nasal cavities rather than anything in our mouth (10). There are many different ways to use wasabi, but it loses its spicy flavor when exposed to heat. Some good ways to use it include as a topping on food, to make spicy salad dressings, and combining it with sour cream makes a good dip. Key Point: Wasabi is one of the spiciest condiments, but it certainly makes food more flavorful. Sour cream is another condiment that enjoys popularity in Mexico, and in combination with salsa and guacamole, we can find it in several famous Mexican foods. However, Mexican food is far from the only way to use sour cream, and it is very adaptable. For one thing, thickened sour cream mixed with several herbs makes a tasty sauce to top a variety of meat and fish-based meals. On this note, salmon topped with a reduction sauce made with sour cream, salt, parsley, and dill tastes great. Using sour cream as a condiment for burgers and steak also works well. Key Point: Sour cream is a tasty and adaptable condiment that we can use in a variety of ways. There are many different kinds of vinegar available to buy, but one of the lesser known varieties of these is coconut vinegar. With an acidic and slightly sweet taste profile, it can add an exciting and tasty flavor to our food, and it works well in Asian-style cooking and curries. Similar to all vinegar, it should also have anti-glycemic benefits since it contains a reasonable amount of acetic acid (6). For an in-depth guide to coconut vinegar, see this guide. Key Point: Coconut vinegar is one of the rarer kinds of vinegar, but it has a flavor profile well-suited for Asian dishes. Salsa is a delicious Mexican condiment, but it often contains unnecessary ingredients like vegetable oil and large amounts of sugar. On the positive side, if we make it ourselves, we can include the healthy ingredients and skip the rest. The easiest way to make this is to add all the ingredients into a food processor and hit the ‘on’ button, but everything can be chopped and mashed manually if that is not an option. There are many ways in which we can use salsa, but using it as a dip and stirring it into cooked dishes are the most typical usages. Key Point: Salsa is a spicy, flavorful and delicious condiment. Although we may not think of peanut butter as a condiment, much of the world uses it in this way. While in the West peanut butter is typically a sandwich-filling, Asian countries like Thailand and Vietnam use it in their cooked dishes. Some famous foods that use peanut butter in this way include Thai peanut chicken and noodles in peanut sauce. Peanut butter tastes great with almost anything – even by itself. It also has a reasonably good nutrient profile, and it is rich in protein and a variety of vitamins and minerals. Note: the quality of peanut butter can vary between brands, and some brands include trans fats (labeled as ‘partially hydrogenated oil’). A good-quality peanut butter need not contain anything other than peanuts and salt. Key Point: Peanut butter tastes delicious alone, and with just about everything else too. Sesame oil is quite unusual in the way that it adds an amazing flavor to almost anything you add it to. Most seed oils (otherwise known as “vegetable” oils) taste horrible, but this one actually tastes good. For this reason, numerous Asian dishes add a slight amount of the oil to dishes after cooking to enhance the flavor. As a condiment, it is probably the best-tasting oil in the world. See this full guide to sesame oil for more on ways to use it and the health benefits and drawbacks. Key Point: Used occasionally, sesame oil can be a tasty way to improve the flavor of a dish – only a small amount is necessary. Cheese tastes delicious in whatever form it is in, and cheese sauce is no different. This tasty condiment can improve the taste of most dishes, and there are not many foods that don’t combine well with cheese. Although store-bought sauces can be an option, it is again healthier and a lot tastier to go with the homemade option. To prepare this cheese sauce, add the heavy cream to a pan, bring to a boil and then reduce to a simmer. Next, chop the chives and mash the garlic and then add the rest of the ingredients except cheese. Keep simmering until the cream reduces and thickens in consistency, and then add the cheese near the end. Stir in well until the cheese has fully melted, and then take the sauce off the heat. Key Point: A homemade cheese sauce is straightforward to make, and it is compatible with a large variety of foods. As this article shows, there are all sorts of tasty condiments out there. While a lot of the commercial options contain excessive amounts of oil and sugar, it is easy enough to make simple, fresh homemade versions of these. All in all, condiments can positively contribute to the overall flavor of many dishes, and they often bring a few health benefits along too. Hi, I’m quite surprised you didn’t include Apple Cider Vinegar in your list; it’s perhaps one of the most delicious, versatile and nutritious condiments there are; its uses are virtually endless…? Hi Alexandra, yes… apple cider vinegar is great too and I also enjoy that. Unfortunately, there was a limited amount of space, so I wanted to mention a couple of the lesser known vinegars (red wine and coconut) that people don’t know so much about.